Laoconnection.com: LLR (book): Greatest Real Modern Lao Drama! I came across a really interesting little book by accident while browsing for Lao books online recently. Surprisingly, this book is inexpensive and can still be readily found. When I started reading this book I could not put it down. I kept thinking what an incredible movie the events during this time would make. There was a lot of scheming from all sides, Lao and foreign individuals and governments. It's an interesting read for the insightful facts and stories both in front of the scenes like those published in the newspapers and also for its behind the scenes occurrences and stories that happened in Laos during the 1950s and 1960s when the country was still in a lot turmoil, civil unrest and the government was changing regularly. This book was written before the Pathet Lao officially took over in 1975. The late author was an American woman who was pro-communist so be warned that she writes from that point of view. She wrote a lot of books about the communist movement throughout the world including Southeast Asia. While she is pro-communist, she doesn't fall prey to the exaggerations or stories that she comes across. She recognized the faults, corruption and failings where they happened. And for that I can appreciate that she attempted to be impartial and independent about all the information she obtained. She writes in a concise, easy to follow and knowledgeable manner. Interestingly, she was able to speak to and interview all sorts of high profile characters during this time including, but not limited to, Prince Souphanouvong, Capt. Kong Le, French and American contacts, and so fourth. Mind you, reading this does not make you a communist by any means. It does however make you more aware of the struggles the people of Laos were going through while being under the royal monarchy and the French and how that fueled support for the Pathet Lao. According to the book, the Pathet Lao forces helped to fill in a void and helped to provide a voice for the people in addition to fighting for equality. More generally, the book helps to provide a different perspective on what went on in Laos during that time. 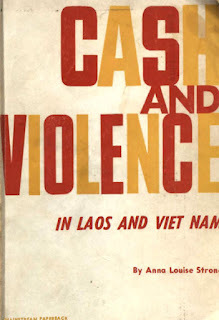 There are only a small handful of books written on Laos' civil war exclusively - this is one of them. Other books on the Vietnam War may mention Laos in passing. If you're a war history buff, this book is for you. I recommend it. John Foster Dulles, US Secretary of State under Eisenhower, twice offered and encouraged French Premier Bidault to use the atom bomb in Indochina which he refused. American government chose not to support the results of a democratically elected government in Laos because in one instance many seats were won by the communists. Instead they chose to support individuals who acted as dictators and were quite repressive. This only provided more fuel and criticism against them and the Royal Lao Forces. The name Pathet Lao given to the communist forces was by accident. While at the Geneva Conference in 1954, they signed their documents as Pathet Lao with the intent of it to mean "Lao Land" or "Lao Country" as a whole of the government, people and land. Prince Souphanouvong did not mean it to be the name of his political movement or party but the name stuck with them. And they didn't seem to mind. The official name of the communists forces was actually Neo Lao Otsala and then later changed to Neo Lao Hak Sat. Minor error: When the author describes the 3 former kingdoms of Laos, she mentions Savannakhet which is incorrect as the third kingdom was Champassak (the other two being Vientiane and Luangprabang).